Android users will find it easier to find bargains this holiday season with the free app Google Offers available at the Android Market Thursday. The Google Offers app is designed to help shoppers discover, buy and redeem deals on the go. Not only can you purchase deals with a few clicks from your droid, but with some merchants, you'll be able to redeem deals directly from your phone. A "Featured" screen that's the deal of the day. Thursday's deal, for instance, is a coupon that you buy for $15 that can be redeemed for $25 at REI, an outdoor clothing and equipment retailer. 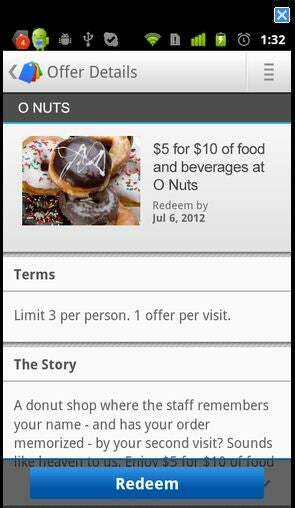 A daily deal notifier, which alerts you about deals. An archive screen where you can see deals that you've purchased or saved, as well as deals that have expired. A screen for redeeming offers without printing them. Initial reviews of the app at the Android Market have been positive. With more than 130 people weighing in on the software, the app's garnered an average rating of 4.5 out of a maximum five stars. User reviews of the Google Offers app are mixed. Some praise it for simplifying Google Offers by allowing them to skip having to check there inbox. Others like the fact the app allows you to check a deal out via the app and make a purchase from within the app as well. Still some are complaining the app's performance on a tablet was "sluggish" and that the Google Offer's menu button didn't work. While the Android app may for the moment generate some envy among iPhone deal seekers, Google is promising that similar software for Apple's mobile will be available soon. Google launched its Offers program in June in Portland, Ore. As the company rolled out the offering in more areas, it found that it needed to expand its offers so last month it announced it would offer deals from other deal sites with its own offerings. While Google will continue to secure deals directly from merchants, the company explained, it has decided to complement Offers with coupons from other deal brokers. The partners it has chosen focus on special areas, like outdoor products, so that overlap is minimized. Too Late to Jump on Groupon Bandwagon? Google was a late comer to the daily deal business, and debate rages over whether or not the business has peaked. Because of the success of outfits like Groupon, scores of copycats emerged stuffing email boxes with more deals than many consumers could handle. Other analysts, though, say "deal fatigue" isn't hurting the market yet. "We find no evidence of daily deal fatigue," wrote one pair of researchers in September. "Instead, the heaviest daily deal users (those who have purchased 11 or more deals) are the most enthusiastic about them." Those habitual users "indicate the greatest interest in checking their e-mail for deal offers every day, have little trouble in using the deals before they expire, believe that daily deals help them save money on things they would have purchased anyway, and say they have integrated these deals into their usual shopping behavior," they added. What's more, all of the daily deal users in a study performed by the researchers said that they intended to purchase a deal within the next month.